I’ve been flying in the Gulf of Mexico for almost 2 years now, weird to think it’s been that long. When I came back from Kuwait it was right at the height of the downturn. Layoffs and hiring freezes were everywhere. I spent 11 months as an unemployed pilot and was even starting to consider a career change. In the time I’ve been down here I’ve flown for RLC and now I’m with PHI – and with both companies I flew as an “off-shore” pilot. As in, I stayed off-shore. It was mostly due to the fact that I had more time than most of the other “new hires” so I was able to qualify for contracts with customers that wanted extra time beyond the 1500 hour hiring minimum. With PHI my current customer wanted extra experience like 50 hours in type, and a winter of winter in the Gulf flying experience off-shore – so of the 40+ new pilots PHI brought on, only a few of us actually qualified for these jobs. If you were to ask me what life is like for a pilot that stays on-shore in base housing, with other pilots…I’d have to refer you elsewhere. My schedule is 3 nights off-shore, and then 1 night “on the beach” so that maintenance can take a look at my helicopter and do any scheduled work. With RLC I stayed on a platform in the Vermillion lease block. All of the “fields” down here are broken into blocks, and named one thing or another. Each of these blocks is then broken into smaller numbered blocks, like South Marsh 251 or Eugene Island 11. I was flying a “loop” contract for one of RLC’s customers at the time, based out of the Mouton Cove base. The living quarters on that platform were fairly small. One office, a common area with a TV, dining table, and kitchen. The common area was connected by a short hallway (with a washer and dryer in it) to two bedrooms, each with four bunks, and a bathroom with one shower and toilet. On a typical day there were only 4 of us on the platform, two operators, one lead, and the pilot. We would start early in the day, myself, two operators and an L-4. Flying “the loop” would take us the whole day and whomever was left behind on the platform would make dinner for when we got back….9 times out of 10. Sometimes we were left to our own devices. Fast forward to my current contract with PHI. I’m staying on a complex facility (multiple structures connected with catwalks) that on average has 30 people on it, but is designed for over 100 people (we’ve only been at capacity a few times since I started flying this job last year). The top of the facility is my domain. 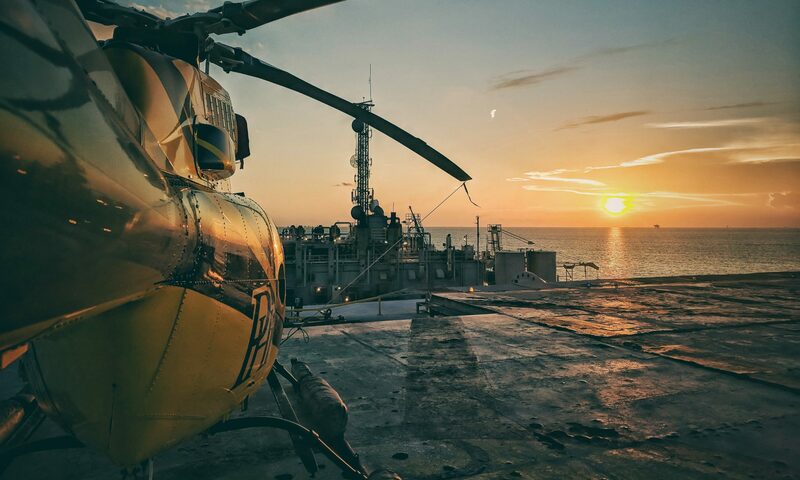 The heli-deck, or heliport, whatever you want to call it. Several storage boxes containing straps, inlet pillows, fuel sample jars, cleaning supplies, a ladder for pre-flight, and other miscellaneous equipment line the side. This facility has fuel on it, so I’ve got a fuel station off to one side, and welded in tie down points. My day starts and ends here, in the morning removing all of the tiedowns and fueling the helicopter. At the end of the day we perform a “daily inspection” which is a lengthy version of a pre-flight. Put the tiedown straps back on, including putting pillows in, and blades straps on. My job is “field support” which affords me the luxury of having my customer dispatcher in the field with me. The office itself is where I spend a good chunk of the day between flights, it’s also where my ethernet cable is located so I can upload my logs at the end of the day. One of the best parts of this job is the fact that the PHI Pilot on this platform has individual quarters. I keep a uniform out here in a locker, as well as a shaving kit, basic supplies, some snacks – so that I can fly with less stuff in my “go bag”. A small desk gives me a place to work (I’m writing this blog post here right now), and I even have a TV hooked up to DirecTV satellite. Though I have my own room I don’t have my own bathroom – which is the only logical next step up. Some of the rooms for the big-wigs out here have their own, but for the most part the rest of us use 1 of 2 shared spaces. each one is equipped with 4 showers and a row of sinks which tends to keep the crowding down to a minimum. two shared bathrooms, and five rooms – each with an individual sink for personal hygiene. The trailers aren’t the best, the apartments are pretty nice. I recently killed a wasp that was living in the ceiling of my trailer, and the air conditioner has failed twice this year alone. So, like I said above, I prefer my off-shore living conditions. That first platform I was staying on had a small outdoor space with some free weights and a gerry-rigged cable system as its gym. Enough to get the job done, but not exactly a Gold’s. The platform I’m currently staying on actually has a dedicated, indoor, space for the gym. Equipped with a squat rack, bench press, a ton of free weights, a sort of combo-cable-machine, and a treadmill. It’s a pretty sizable upgrade, however once you get more than 3 people in there working out it starts to feel really small. I’ve started pushing my workouts to later in the evening, in order to be able to get more free-range with the equipment and weights. to an array of coffee pots in the morning. We have a selection of a dozen cold cereal types to eat and baked goods galore. A very large tv room pulls double duty as a tv room/common space for anyone to use and as a meeting room for the twice daily safety meetings and any other special briefings. We have safety meetings in the morning at 0600 and in the evening at 1730. We also have a large “smoking area” that is also a pretty popular hang out, because it is one of the only places you can get the guest wifi signal that comes on at night. This is also the muster area for the complex where, in the event of a drill or actual emergency, all of us muster. Hence the name, muster area. So there you have it, that’s life off-shore. I end my duty day with paperwork and a thorough post-flight inspection. Have dinner, a safety meeting, hit the gym, and then the shower. Afterward I retire to my room and watch a movie, read a little, and maybe write a blog post. If you have any questions about off-shore flying, the gulf of Mexico, or anything pilot or travel related. Please send them my way and I’ll try and answer them all. Really really interesting!!! Thanks a heap for the words and photos! EI-43AA. Been there numerous times. Do you enjoy the AT&T service out there? I actually use T-Mobile, and since it’s so close to the beach I get fairly good service. They’ve recently put a dozen or so signal boosters around too. My problem is that tampnet is so strong my phone connects to their Network first.